Today we rode the road less traveled and it made a big difference. Not much difference in our average speed or total distance, but a difference in experience. The road was narrower. It had fewer long slow grades but the hills it had were steeper. One long hill today and the rest were small hills. Last night something nabbed my food bag. I had a stuff sack from my sleeping bag with a loaf of bread, crackers, chocolate and other foods. The stuff sack and all were gone. I looked for it and didn’t find it nearby. I ate some trail mix and set off down the road. We had a nice quiet road with a few ups and downs. 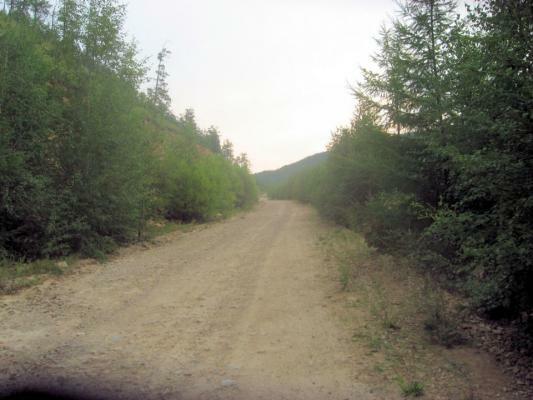 At 13km began a long slow hill. At first it was possible to ride, but afterwards I ended up walking the top of the hill which came a little past 16km. The descent was slow since it was rocky. We had more level stuff and Ксеньевка at 30km. We waited for Mickey and then found a cafe and store in town near the railroad station at 33km. It took a little bit to find our way out of town. A helpful motorist led the way. 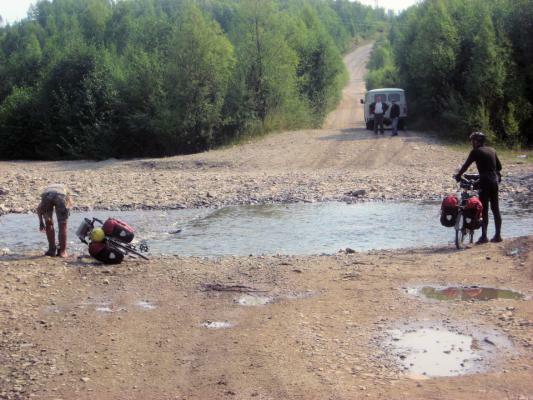 This included fording a river without a bridge. After this the road was a little flatter but also had more loose gravel and it became warmer. We stopped briefly to fix a flat in Bert’s bike and stopped under a railroad bridge for lunch at 50km before riding a little further to finish the day.